Tuscany with View and Heart. Pool and Charme. What did I NOT like about Villa Ceppeto? ...We can't stay longer! As soon as you arrive, the wonderful view of the Medieval village of Monte San Savino makes you immediately exclaim "Here we are in Tuscany"
with 750 olive trees that frame it. You can reach the most suggestive places of Tuscany, the same ones depicted in the paintings of Leonardo da Vinci, Botticelli, Pier della Francesca. Located on the borders of Chianti, 30 minutes from Siena, 20 minutes from Arezzo and Cortona, 1.5 hours from Assisi, 1 hour from Orvieto and Florence. For horse enthusiasts only 10 km away..and present Arezzo Equestrian Center and one of the largest and most important SHOW GROUND in the world dedicated to horse riding. The Villa consists of 3 beautiful and well-kept apartments: La Limonaia, Il Granaio and Il Fienile. There is a double bedroom, from the windows of each of these the breathtaking view of Monte San Savino will leave you happily surprised, a bathroom with shower, a fully equipped kitchen, large barbecue, each apartment has an outdoor area to relax and dine. 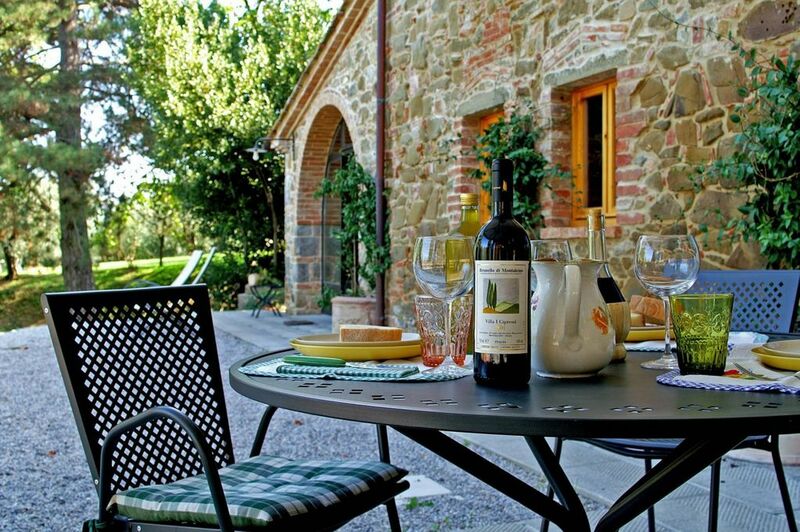 At Villa Ceppeto Privacy is assured and the ideal place for families, friends and even honeymoons. The pool immersed in the greenery of the park between scents of seasonal plants, songs of birds and the melodious chimes of the bells also enjoys a spectacular view of the village ... at sunset when the first lights come on the country the landscape is fairytale. The friendliness and courtesy of the owners and the deliciousness of the delicious cakes prepared by Manuela will make your stay an unforgettable holiday. Great location and perfectly comfortable apartment. Super view across the valley to Monte San Savino. Property owner very nice, low key, and efficient. Highly recommend. Grazie David! It was a real pleasure to meet you there! Please come back soon. The property is beautifully situated on a hill opposite the city of Monte San Savino which you can see while sitting by the pool or from the living room of this well appointed two bedroom flat. The space was beautifully remodeled from a barn into a comfortable two bedroom, two bathroom unit. We enjoyed the peace and quiet of being on a lovely lane in the country and yet being only minutes from the town and the City of Arrezzo and all that Tuscany has to offer. We will make a point of returning on our next trip. This is very kind of you! Thank you SO much. We spent a lovely fall week in the one bedroom Il Granaio apartment. The apartment was beautifully restored, the high wood beam ceilings and arched windows set the tone for the well furnished rooms, huge bath and shower, and a well equipped kitchen. We did much of our own cooking, shopping daily in the nearby old town or the very well stocked Coop supermarket just a few minutes drive away. Even though all three apartments were full, it was very quiet and private, and the views from the apartment were spectacular. In less than an hours drive we visited Florence and her museums, Sienna's stone walls and towers, Cortona's steep ancient stone streets, and several of the multitude of nearby wineries. Driving in Italy was very easy, the mountain roads and views were amazing, however be sure to bring or rent a GPS (I only got lost by design). Daniel and Manuela were perfect hosts, responding to every request quickly yet allowing us privacy in the beautiful country setting, and shared with us their house made wine. We were able to watch them harvest and crush the 2015 crop, we hope to be back to sample the finished product in a few years. Out first trip to Italy and Tuscany, we felt welcome, comfortable, and highly recommend the area and especially Villa Ceppeto hosted by Daniel and Manuela. You are very kind! Thank you so much for your nice review. We are really making our best.